Yuke's Company of America loves downloadable gaming platforms so much that they've just created Akinai Games, a special division with a special logo, devoted to creating downloadable console titles. Yuke's recognizes the growing shift towards downloadable titles with Akinai Games, which loosely translated from Japanese means "keep entertained." The division will be focused on creating downloadable titles for WiiWare, Xbox Live Arcade, and the PlayStation Network, with PC and mobile games still under consideration. That's lovely...now what's with the adorable little kitty cat? He's based off of the "Maneki Neko", or "Lucky Cat", a Japanese sculpture that store owners place in the entrance to their shops to bring good luck. I demand t-shirts immediately. YUKE’S Company of America, a leading video game publisher, today announced that it has officially launched Akinai Games. The new division represents an ongoing, industry-wide shift toward downloadable game platforms, and its main area of focus will be on developing games for this distribution model. Akinai will be developing titles for various online platforms, including Nintendo’s WiiWare™ channel, Microsoft's Xbox LIVE®, and Sony's PlayStation®Network (PSN), while plans for PC and mobile device distribution are under consideration. The first title to carry the new Akinai Games brand will be Evasive Space, the upcoming WiiWare title developed by High Voltage Software, set for a January 2009 release. Akinai Games’ mission is to embrace the future of gaming in today’s digital age, and to establish itself as an industry leader in providing fun and innovative downloadable titles across multiple gaming platforms. “Akinai,” in Japanese, is loosely translated to “keep entertained,” symbolic of the company’s effort to offer a variety of high quality and fun downloadable games. 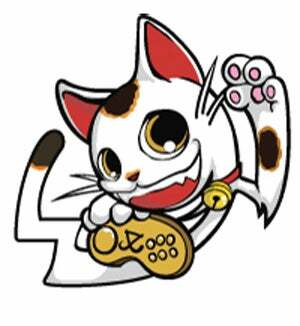 The company logo was inspired by the “Maneki Neko” or “Lucky Cat,” a traditional Japanese cat sculpture which is believed to bring good luck to its owners and is typically displayed at a storefront’s entrance. The arrows within the Akinai Games logo represent the uploading of video game entertainment for consumers to download and enjoy. For additional information about Akinai Games, please visit the new website at: www.akinaigames.com.